The magnificent city of ruins, only 350 km. from Bangalore It is a World Haritage Center, Hampi is the most beautiful and evocative of all the ruins in Karnataka, near Bellary on the way of NH 13. The 14th century Vijaynagar Empire, one trend to lose all sense of time admiring the magnificent capital of the Virupaksha Temple, the Ugranarasimha statue, the Lotus Mahal. The Hemakuta Hill, The Mahanavami Dibba, the Hazari Rama Temple, The Vittala Temple, here is noted for its sculpted stone chariot and carved pillars with the 56 musical stone that produce musical notes when struck. Air: Nearest Airport – Bellary 74 Km. Rail: The nearest railhead is Hospet 13 Km. Road: 350 Kms from Bangalore. 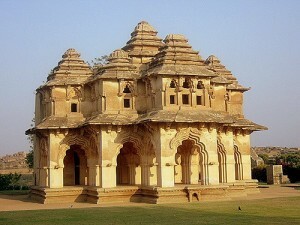 This entry was posted in Humpi, Karnataka and tagged about humpi, hampi, hampi map. Bookmark the permalink.